Your baby is born with a fully-formed set of baby teeth just below the surface of her gums. It’s important to start taking care of those teeth, even before they break through! Sure, she’s going to start losing them when she’s about 6, but while she has them they play a crucial role in her development. Baby teeth are temporary and start to fall out when children are about 6 years old. Why do we have two sets of teeth, and why are we encouraged to take care of the first set if it’s going to fall out? 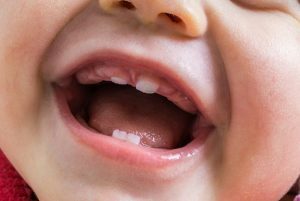 We have two sets of teeth simply because our 20 baby teeth are the right size for a baby mouth, and our 32 permanent teeth are the right size for an adult mouth. They help babies eat solid food. When your baby can sit independently, that’s your cue to start introducing solids. This is usually around 6 months of age which, not coincidentally, is about when teeth come onto the scene. They help babies speak. Say I love you out loud and notice how your tongue and lower lip hit your teeth in different places. Teeth are part of the teeth/lips/tongue team that allow us to form clear speech sounds. They are place-holders for the second, permanent set of teeth. When your baby is born, the beginnings of his forever teeth are present behind the already-formed baby teeth. Throughout his first 6 or so years of life, this second set of teeth grows and eventually dissolves the roots of the baby teeth until they fall out. If a baby tooth falls out prematurely due to cavities, infection, or decay, it can cause the tooth behind it to “lose its place,” resulting in misaligned permanent teeth. The American Dental Association (ADA) recommends that you start “brushing” your baby’s gums just a few days after she’s born. Bacteria can build up on her gums and affect the teeth underneath, so this will help keep her mouth bacteria-free. Use a clean, damp washcloth or piece of gauze and gently rub it along her gums after feedings. When your baby’s first tooth appears, that’s your cue to get a toothbrush with a small head and soft bristles and start gently brushing any teeth she has, along with the gums around it, every morning and evening. The ADA recommends that when you brush your baby’s teeth, you use a dot of fluoridated toothpaste, the size of a grain of rice. This will help strengthen the tooth’s enamel and protect it from cavities and decay. When she’s 3 years old and able to spit, you can increase the amount of fluoridated toothpaste to a pea-sized dollop. Around 16 months, your toddler may be ready to start “pre-brushing” her teeth before you do the actual job. Allowing her to do this not only supports her burgeoning sense of independence, it begins to instill the habit of brushing her teeth twice a day. You’ll need to help her get the job done until she’s old enough to do it well herself (some children can brush their teeth solo when they’re about 4, for others it takes longer). As soon as her teeth touch each other, it’s time to break out the dental floss to ensure you’re removing anything stuck between her teeth. According to the ADA, you should bring your baby to the dentist as soon as she gets a tooth, or by her first birthday—whichever happens first. A pediatric dentist will monitor your baby’s oral health, offer valuable recommendations about oral care, and guide you in making sure your baby is getting enough fluoride for her teeth. Don’t swap saliva with your baby. You can pass cavity-causing bacteria from your mouth to your baby’s, so try not to clean her pacifier with your mouth or share spoons with her. Stick to breastmilk, formula, or water in bottles. Because the liquid coming from a bottle hits your baby’s teeth in a constant stream, sugary liquids can increase the risk of cavities. Don’t put your baby to bed with a bottle. This can cause the liquid in the bottle to pool around your baby’s teeth and lead to tooth decay. Be mindful about sticky foods, like gummy fruit snacks or vitamins. These tend to stick to teeth and may eat away at the enamel. Try limiting them, or be sure to brush your child’s teeth right after she eats them. You can find out what to expect when teething starts, and how to sooth any teething-related discomfort here.